As luck would have it, I came across some unseasonable, though very beautiful, strawberries at a local market. The temptation was all too consuming to pass them up. I am glad, however, that I hadn’t resisted my urge as it led me to this salad. And although I am not fooled that my unseasonable acquisition of strawberries is superior or even as good as the ones I might find during the height of strawberry season in Berlin, I am comforted by its reminiscent summery-sweetness. During the dark, wet and cold months of winter, these strawberries serve as a subtle reminder that summer will soon be just around the corner. Ok, not really. But, a guy can dream, right? 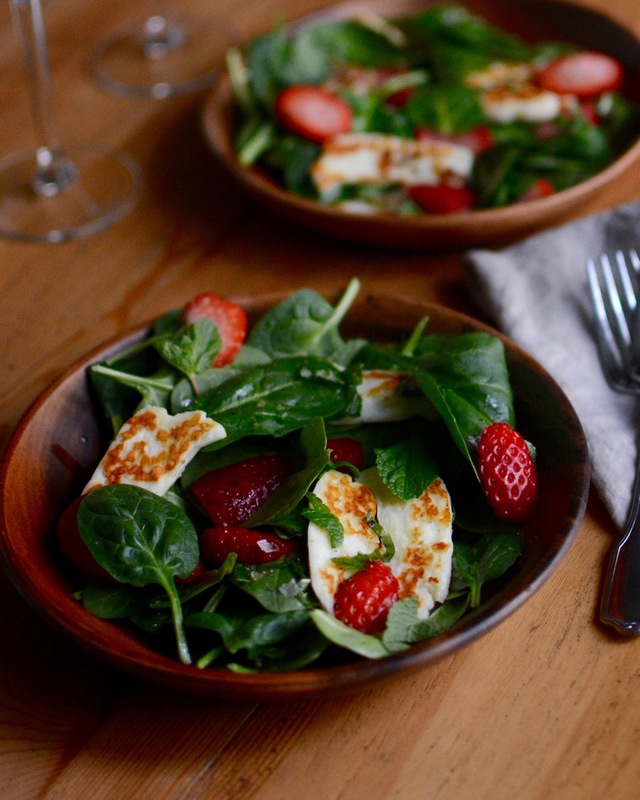 Until then, the strawberries in this salad will just have to do. Strewn the spinach evenly between two plates. Then, scatter the strawberries and mint onto the spinach. Next, drizzle the olive oil and lime juice onto the salads, and sprinkle each salad with a pinch of salt and pepper. Set the plates aside while you prepare the halloumi. Place a frying pan over medium-high heat. Once the pan is hot, place the slices of halloumi in it to brown. Don’t be tempted to add oil. The pan should be dry. The halloumi will begin to release some of its liquid; the liquid will evaporate. After several minutes, you can lift the edge of the halloumi to check if it has browned. At which point, you can flip the halloumi. It should be just past golden in color and its milky surface should be freckled with a beautiful, brown crispy skin. Repeat the process on the other side. Once it has browned on both sides, divide the pieces of halloumi onto both plates. If you wish, squeeze just a little extra lime juice onto the halloumi and enjoy immediately. *Balsamic vinegar or lemon would also work well for this salad.